So we beat on, boats against the current, borne back ceaselessly into October. Every day last month, we celebrated the supernatural. And now the supernatural will not leave us alone! Yesterday the blog was again haunted by Peter Piccolo. And lastnight, you wouldn't believe who I met at a party. 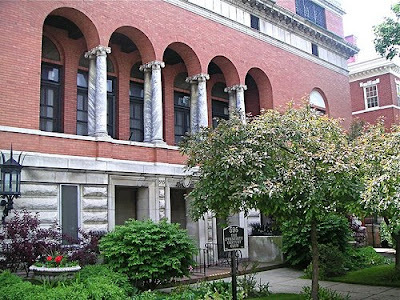 The party was at the Twentieth Century Club, pictured above. It was in honor of my Uncle James Phillips who just officially retired from medical practice. Uncle James is not my actual uncle but he is as good as that because he was my dad's best friend and he gave me away at my wedding. He is the most debonair man in the world and he is legend in Buffalo, I am proud to say. With him retiring all kinds of influential people are scrambling for new doctors. It is stressful and not pretty. Speaking of stressful and not pretty, there I am at the buffet, trying to figure out what I can eat with my braces that will not end up all over this red dress I was wearing. And Howard gets talking with this priest, this Jesuit. And he introduces me: "This is Father So-and-so," he says. "From St. Michael's." I was too distraught to catch his name. The priest turned away for a second, getting a glass of wine or something, and I whispered: "Howard." "What?" Howard said, helping himself to a finger-sized Reuben sandwich. "I think that's the priest I went to confession to." Remember when I told about going to Confession after I hadn't gone for a million years and it was like "The Exorcist" and I was so overcome by it all that I left the confessional in tears? Now there was a good chance I was looking at the man who had been behind the screen! And not only that, I said so to him. Can you believe it? Thanks a lot, red wine! When the priest turned his attention back to us I blurted out: "I went to this very important confession at St. Michael's last spring." I stammered: "I mean, I hadn't been to confession for a long time, and I went to St. Michael's, and --"
Howard asked the priest: "What did she do? What did she tell you?" The priest smiled politely and said: "We can't see who is on the other side of the screen." Howard said later: "That means he definitely saw you." As Mark Twain would put it, let us draw the curtain of charity over the rest of the scene. Everything I said seemed to make it worse. Luckily Howard went on yakking with the priest as if nothing was wrong. But I was just listening to his voice and comparing it with what I remembered from my confession and let me tell you, I am sure this was the guy. It felt funny to be looking at him. Like seeing the Great and Powerful Oz. This priest was not as old as I had thought in the confessional that he was, but he had gray hair and was gaunt and intense. It had to be he! I would just as soon not have run into him when I was at a party holding a glass of red wine and wearing a tight, bright red dress. I would also rather that I had not opened my mouth and said something. Leonard Pennario used to get in trouble for running his mouth and I do, too. St. Michael's should promote itself as Buffalo's Confession Capital. They have confession every day at lunch time. That is their secret. You don't have to wonder what day of the week it is and whether or not they are open for business. That is why everyone goes there. Also the church is conveniently located in the downtown theater district. Plus, St. Michael's is a Jesuit church and there is this myth flying around, which I bought into, that the Jesuits go easy on you. 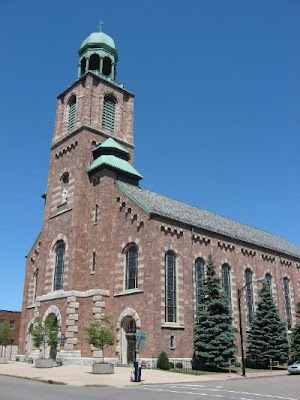 Here is a picture of St. Michael's so if out-of-town Pennario fans are ever in Buffalo, they will know the church when they see it and can go to confession there. My friend Lou from work has been known to make the occasional St. Michael's confession. My friend Michelle went to St. Michael's last year when she had to go back to confession after years of not going. About a few weeks ago, my co-worker Dan did the same thing. He went to St. Michael's too. Lou and I went with him for moral support. And here is something else: My brother George went to confession at St. Michael's just yesterday! That is a whole other story. I should have asked this priest about Lou, George, Dan and Michelle. Heck, I said everything else. It's funny, but I thought confession was supposed to assuage (sp?) guilt. I have heard it referred to as psychology for free. The mythical can of concentrate, etc. We shall open the sealed door.